UP TO US is a non-partisan movement of young people who are working to raise awareness and engage their peers about America’s ﬁscal and economic future. 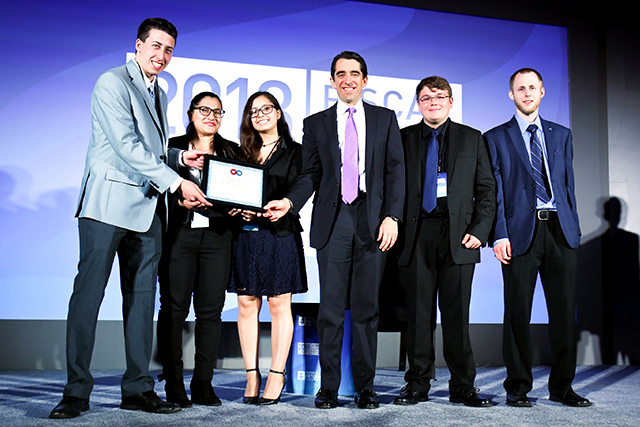 A signature component of the program, which is a project of the Peterson Foundation, Net Impact, and Clinton Global Initiative University, is an annual competition where student teams on college campuses across the country design and implement creative outreach campaigns on the national debt and its eﬀect on the economy. Peterson recognized representatives from each of the top 20 winning teams who were in the audience and then announced this year’s top prize, which went to State University of New York at Old Westbury. Peterson said the winning team displayed “remarkable creativity with a multifaceted campaign. They met with lawmakers, delivered presentations, and engaged campus clubs to drive home the need to address our ﬁscal future.” Peterson highlighted one key tactic: the winners employed a “Debt Boulevard” on sidewalks across campus that included key facts about the national debt, designed speciﬁcally to attract the attention of students at this commuter campus who were walking from their cars to class. SUNY Old Westbury team leader Evan Rufrano said that an important lesson he learned in reaching students was knowing how to “simplify your message” and to connect the ways that our unsustainable ﬁscal outlook will aﬀect young peoples’ lives, careers, and opportunities in the future.